Most of the car-ride in was the usual: a drive on a state road that is full of lights and side streets and shopping centers that is often like a video game in which the object is to avoid being T-boned by some schmo who is incapable of judging velocity and distance; who simply must pull out four seconds after you have deemed it impossible for him to be stupid enough to actually "try it." With this in mind, I set my speed at around 55 MPH. It is a 50 MPH road. About ten minutes from school, a bald guy, with dark glasses, in a shiny, absurdly clean, massive, black heavy-duty pickup truck with tinted windows and double tires in the back started riding my bumper. He stayed there. I kept my speed. We were in the right lane. He could have passed, but I guess that would not have been as much fun. We both turned onto the same rural road (speed limit of 50, dropping in increments to 45, 35 and then 25 as we neared the schools). He stayed on my bumper as I adjusted speed to about five over the posted limits, as I always do. As we approached an intersection, he, disgusted with my mere existence, set his lips, shook his head and gave his heavy-duty pickup the heaviest duty it would see that day by whipping to his right, down a side road. I hope he never finds out how little that head-shake meant to me. Oh, it would have angered me in the past, before I became actually able to feel what we all know to be true: that we shouldn't care about the opinions of random strangers. Twenty years ago, I would have gotten that stomach burn; that pre-fist-balling fight-or-flight impulse. Not anymore. That stuff makes me chuckle now. I'd hate for his carefully (and monetarily) cultivated sense of superiority and masculinity to wind up being as impotent as his...nice, clean, useless heavy-duty truck. I had a similar experience recently and funnily enough, it was also a black pick-up truck. I got a V sign from its owner. My crime had been daring to use my right of way, which forced him to screech to a halt. Once I would have done eveything I could to antagonise him, in some futile attempt at restorative justice, before zooming off into the distance. But now that I'm a father it seems irresponsible to engage in silly, macho contests for the sake of one's fragile, male ego, so I've stopped doing it. I've even bought a boring family car, to replace the 'boy racer' vehicle that seemed to like doing 95mph as a cruising speed. It's not very exciting to drive, but who cares? Steerforth -- All that stuff just has seemed to stop mattering to me, too, but not automatically -- it's often a struggle. But the struggle does get easier, which is at once comforting and troubling... 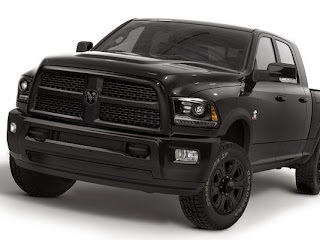 I think we have proven one thing, though: guys in black pickup trucks are mean.